The idea is to make a class or several classes available thru COM. 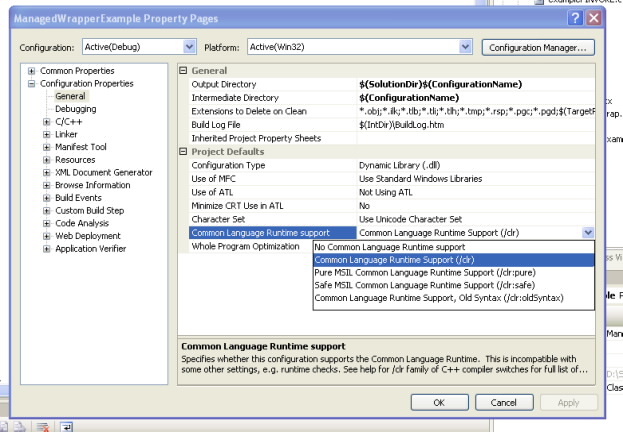 Then the compiled dll or the TLB is used to generate and Interop Assembly and call the desired functions. With this solution the current C++ code base line can be kept or might require just subtle changes. Calling a function thru com is involved in a lot of marshalling and can add an additional layer that is not really needed in the architecture of the solution. The idea with this scenario is to provide a class in Managed C++ that will be available in C#. This class is just a thin proxy that redirects calls to the Managed object. //We can use another namespace, to avoid name collition. //In this way we can replicate the structure of our C++ classes. This is a great tool used for several languages like Python, Perl, Ruby, Scheme, and even in different platforms. The exposure mechanism used in this scheme is platform invoke, the issues here are similar to those of COM because there is some marshaling going on. This scheme might be more efficient than the COM one but I haven’t really test it to be completely sure that it is better. I have reviewed the SWIG code and it might also be possible to modify its code to generate wrappers using managed C++, but this is an interesting exercise that I have to leave for my readers. Sorry I just don’t have enough time. But how is SWIG used? In SWIG what you do is that you add a .i file to your project. This file provides directives for some code generation that specify exactly what you want to expose and how. This can very helpful if you just want to expose some methods. And SWIG will add a file like example_wrap.cxx that you have to compile with the rest of your C++ code. It will also generate a set of C# classes that you use in your C# application, so it seams to your program that all the code is just C#. SWIG is a great tool and has been testing in a lot of platforms. Recently my friend Yoel had just a wonderful idea. We have an old Win32 C++ application, and we wanted to add a serious logging infraestructure so we can provide better support in case the application crashes. The only problem was, how can we integrate these two together. One way was problably exporting a .NET object as COM. But Yoel had a better idea. Create a C++ Managed application that will comunicate with the LOG4NET assemblies, and export functions so the native applications can use that. How great is that. Well he finally made it, and this is the code of how he did it. Ok. That's all. Now we have a managed C++ DLL that exposes some functions as an standard C++ DLL and we can use it with native win32 applications. // Log4NetForC++.cpp : Defines the entry point for the console application.